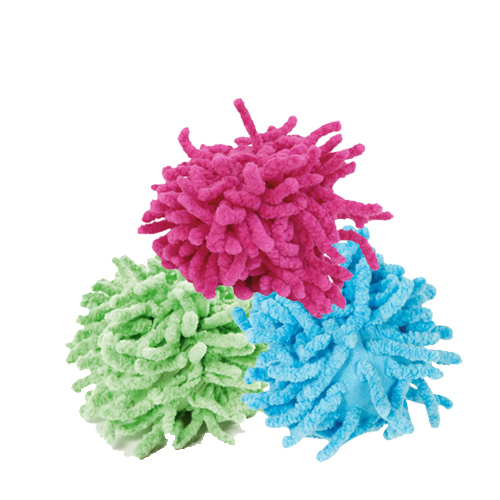 The KONG Cat Moppy Ball is a brightly coloured claw toy for your cat. The added catnip makes the toy irresistible. Playing is very important for cats and a nice way to spend time. It prevents boredom and ensures that the cat keeps moving. The KONG Cat Moppy Ball is fun for your cat to claw at. The rattling sound in the ball provides your cat with even more entertainment. What's more, this toy contains high-quality North American catnip. Catnip contains nepetalactone. This substance is a stimulant for the cat. Catnip is safe for your cat and does not contain any harmful substances. You cannot select your preferred colour for this product, it is delivered at random. Dimensions: approx. 9 x 8 cm. Have you used KONG Cat - Moppy Ball before? Let us know what you think about this product.